For our fifth Green Teas(e) we went to Govanhill Baths and what an appropriate venue it turned out to be for this special Green Teas(e). Our plan for the Green Teas(e) project was to integrate the arts in Glasgow with sustainability, and Govanhill Baths provides a great example of people building a sustainable community using the arts as well as other areas of work. There’s not room to go into it here, but the Baths are well worth a visit. And great to hold an event in, with terrific catering from Saladin’s. 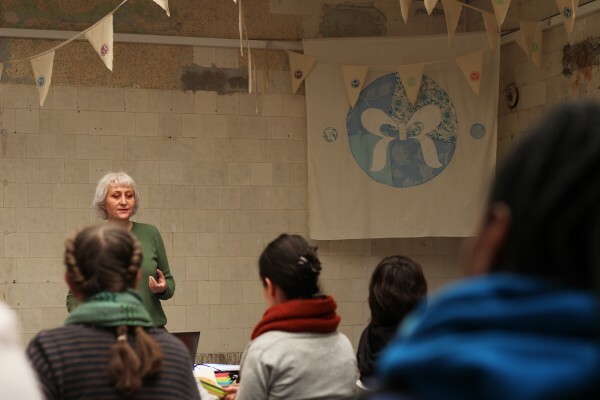 The April Green Tease was special because it was Glasgow’s contribution to the Green Art Lab Alliance, an EU project bringing together over 20 partners in 17 countries to look at sustainability and mobility amongst arts workers. Glasgow Life is the main Scottish partner, working with us at CCS, and this event was supported by EU funds. In previous Green Tease we’d been beginning to map out a route to a more sustainable arts in a more sustainable Glasgow. The hardest thing about this was to get practical and real, rather than have a more theoretical conversation. So this time we asked people to propose specific projects that would help get to that more sustainable Glasgow and arts, or would be representative of it once we got there in 2020. A good group of around 30 came along, and we started with a very personal recap by Penny Anderson of the Green Tease so far. It was good to hear how useful she’d found the group – if for no other reason than finding out bits of useful information, such as that wallpaper paste is as good for making papier mache as PVA. She also put in a plea for arts organisations to work with artists to increase sustainability – the individuals can’t do it on their own. A big question for her, which has been touched upon by others at previous meetings including Ellie Harrison, was ‘Is art more important than reducing our carbon footprint?’ Art is wasteful but important, can be useful and we love it. It’s a dilemma, but informed choices making use of practical, relevant information can help. Governance, boards and leadership. How do these key issues affect Boards and Senior Leaders in the arts? Sholeh pointed out the importance of working slowly but steadily and gave an example of Ufa Fabrik in Berlin as an organisation that had grown over years into a great example of arts and sustainability working hand in hand. She also pointed us to the BAC in London which had taken to new levels their work with the audience, abandoning the idea that despite their old and difficult building, audience should expect the same temperatures all year round and instead saying – ‘bring warm clothes in winter, cool ones in summer and we’ll provide blankets and fans to help you feel comfortable’. There’s plenty more inspiring stuff to be found on JB’s website and not enough space here to do it credit, but finally Sholeh gave us prior notice of a Sustaining Creativity event on 28 May – a date for our diaries. After Sholeh, Rachel Duckhouse and Angharad McLaren gave a quick and impromptu talk about the recent Mull residency that CCS had hosted with Comar. 10 artists spent the weekend discussing arts and sustainability and the general feeling was that – like the Green Tease – it had proved invaluable simply to be able to focus on the topic for an extended period of time. We had noted the importance of ownership of the topic by artists, that leadership is required but that it may be dispersed – an idea that has arisen at the Green Tease a number of times – and that the artist does have a role to play. Enormous thanks to Sholeh, Penny, Rachel and Angharad for their terrific talks. There’s lots going on. Angharad McLaren – Darn It! Mending and creativity….